Medicines management: Should I sign for medicines before I witness the patient taking them? Ward drug rounds can be time-consuming, and patients on multiple medications can take a while to ingest their medicines. If you prepare the medicines at the drugs trolley and then delegate the task of witnessing the patient take them, you may not actually see them being administered. Signing for medicines before they have been ingested by the patient can cause problems – it may look as though they have been administered but they can sometimes remain on the patient’s locker or bedside table, and are in fact omitted doses. One method used in some hospitals is the ‘pot & dot’ system, in which medicines being prepared are put into the patient’s medicine pot and a dot is then placed in the corresponding date and time space on the medicines administration record. Once it has been confirmed by the patient, a relative or the delegated member of staff that the patient has ingested the medicines, the dot can be replaced by a signature or the initials of the registered nurse. This technique can be used on a paper medicines administration system, but it may not be available on the increasing numbers of digitalised electronic drug charts. If you use an electronic prescribing and administration system, talk to the software provider to see if a pot & dot system can be introduced. 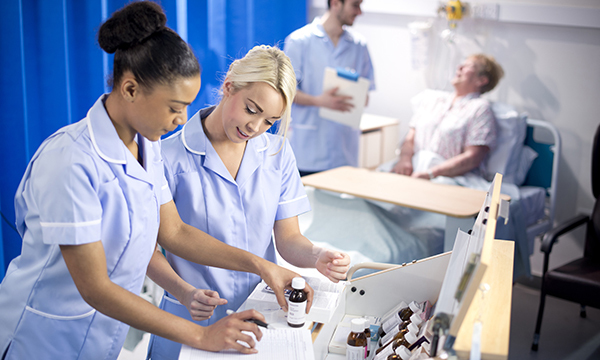 Omitted medicines are a problem for many hospital patients, and the ever-reducing number of nurses on wards makes this a growing problem for registered nurses, who hold the ultimate responsibility. If a patient doesn’t receive their medication in a timely manner it can have a detrimental effect on the care they receive, as their condition may worsen. Look at the systems used on your ward, and work with your hospital pharmacy, nurse managers or medicines management nurse to ensure you are meeting your patients’ needs safely and effectively.